“The erection of important business premises has been commenced at the corner of Broad Street and Cornmarket Street which upon completion will provide extensive show rooms, etc., for Messrs. William Baker & Co., of Broad Street. Accommodation has also been arranged for Messrs Martyr’s hairdressing establishment. The buildings will take a curved line uniting the street improvement scheme, and will be in Ancaster stone with Stonesfield slating to the fronts. The elevation will be divided into six bays with coupled columns to the height of the first and second floors, above polished Ancaster stone piers on the ground floor; and enriched cornice occurs over the third-floor windows, above which the roof will spring. 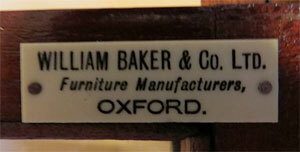 William Baker did not have far to move into the new premises. From 1846 to 1915 William Baker & Co., “cabinet makers, upholsterers, carpet factors, house decorators and complete furnishers”, had been situated at 1 Broad Street, to the east of this corner. In 1865 Baker’s built an additional showroom, and from 1882 to 1887 only was in partnership with Prior (probably Harry Neville Prior, who had a furniture shop in Queen Street). In 1882 Baker & Prior built a new four-floor warehouse at the rear of 1–3 Broad Street, converting the upstairs of the original shop to the Ship Hotel: care was taken to preserve the Martyrs’ Tower (one of the bastions of the old city wall which ran through the premises), only for it to be destroyed in 1928 when Boswell’s was built. Photographs from the 1890s indicate that as well as the warehouse at the rear, William Baker occupied the whole of the ground-floor area now occupied by Boswell’s. On William Baker’s death in 1902, William Baker & Co. were taken over by Elliston & Cavell, who in 1915 commissioned this new building. It was designed by Messrs N.W. & G.A. Harrison of Turl Street, in consultation with Payne Wyatt of London, and the builders were Messrs Wooldridge & Simpson of Oxford. The shop flows seamlessly into 1 Broad Street to the east and 31 Cornmarket to the south. Elliston & Cavell’s was taken over by Debenham’s in the 1960s, and they closed the William Baker shop in 1987, after 141 years in Broad Street. As the building has no number, it is still known as William Baker House. 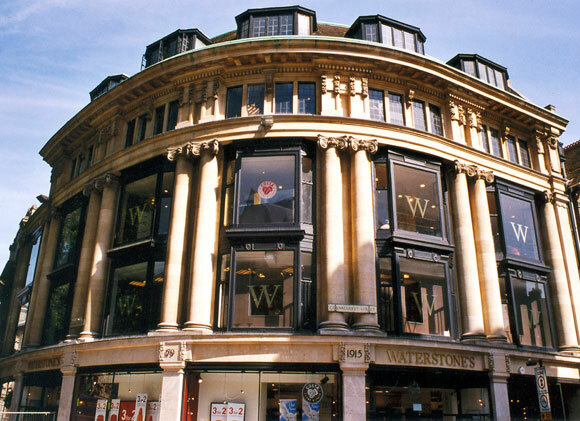 Since November 1987 it has been the home of two bookshops: first Dillon’s (opened by the Chancellor of the University, Roy Jenkins), and now Waterstone’s. 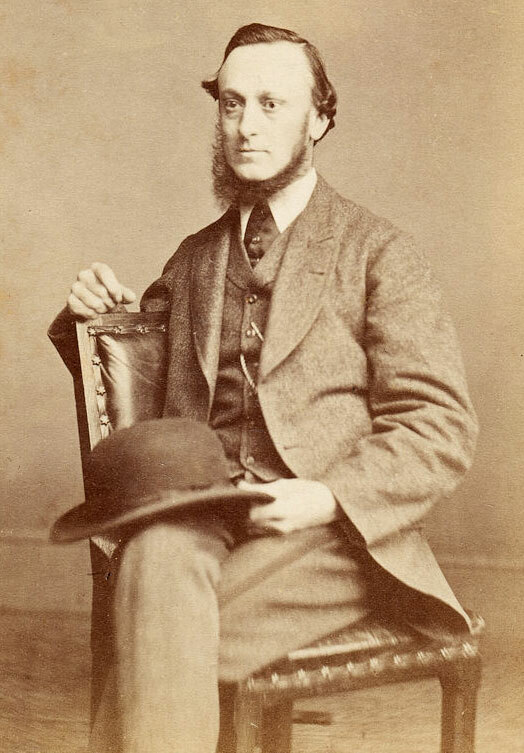 William Baker was born in Bicester. The 1891 census shows William Baker (48), described as a cabinet maker & upholsterer, living at 16 Rawlinson Road, Oxford, with his son William H. Baker (18) who was born in Long Hanborough, and his daughter Hilda M. Baker (16), who was born in Oxford, plus a cook and a housemaid. Willilam Baker died in 1902, but his business survived until 1987 (although latterly it only sold furniture, and did not make it). 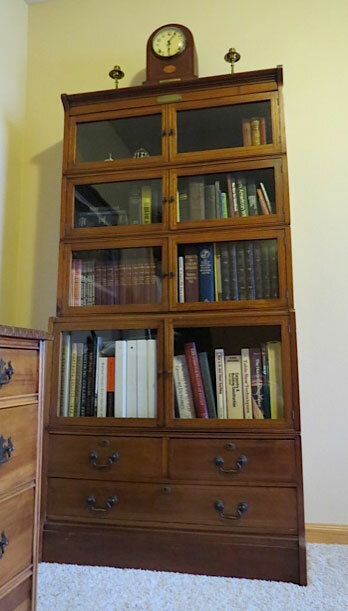 Right: Five-piece inlaid mahogany bookcase made by the William Baker firm with a plaque at the top showing that it was presented to William Brown in July 1920 (together with the clock on top) on his retirement from the Penrith & District Railway.